As Executive Director of The Transition Network, Susan has lived the transition that the organization was founded to support. 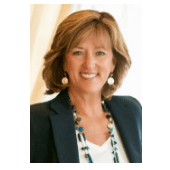 After leaving her long-time career in homebuilding in 2007, she joined TTN, became a member of the steering committee of her local chapter, then decided she wanted to lead the organization and bring the message of “embracing change after 50” to as many other women as possible. As a national organization, TTN plays an important role in the growing positive aging industry. In twelve (with more being formed) chapters around the country, women connect with one another to discover their own path to a meaningful next stage of life. They come together in transition peer groups and workshops, attend programs, and enjoy each other’s company socially for the purpose of continued learning, personal and professional development. Susan received a BS in marketing from Rutgers University.